In what is believed to be the first time a terror attack has successfully targeted Australia alone rather than as a Western nation, a massive car bomb exploded outside the Australian embassy in Jakarta on Thursday Sept. 9, killing nine and injuring 182. Unidentified suicide assailants carried out the assault by detonating a Daihatsu van packed with high explosives and fertilizer at the fates of the embassy. Recently installed security measures had prevented the entry of the vehicle into the embassy compound and all of the reported deaths were either members of the public waiting at the entrance or locally employed embassy staff. The bombing occured just two days before the third anniversary of Sept. 11 and is believed to be the responsibility of the Al Qaeda linked militant Islamic group Jemaah Islamiah (JI). Because of its similarity to other JI operations, Indonesian police announced that they suspect Malaysian JI bomb experts Azahari Husin and Noordin Mohammed Top to have masterminded the process. "Our suspicion is that it was by the same group, especially the bomb maker, Dr. Azahari," said national police chief Da'i Bachtiar on television. "This is what we can conclude from the modus operandi and our investigation." An unverified message on an Islamist Web site claiming to represent JI declared responsibility for the blast and called for Australia to leave Indonesia and Iraq. The message warned of further attacks should their demands not be met. Australian Prime Minister John Howard strongly condemned the attacks and stated his government’s refusal to bow to terrorist pressure. “This is not a nation that is going to be intimidated by acts of terrorism. We are a robust, strong democracy,” said Howard to reporters. 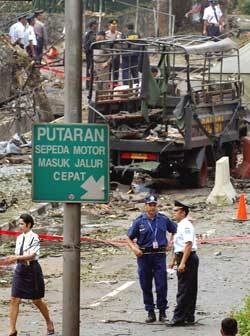 Jemaah Islamiah has been blamed for a number of Indonesian terror operations including the notorious Bali nightclub bombings in 2002, which killed 202 people, and last year's attack on Jakarta’s Marriott Hotel, which killed 12 people. The organization was founded in the late 1960's with the aim of creating a South East Asian Islamic state; however, only since the 1990’s has the group employed terrorism to further its aims. Listed by the United States government as a foreign terrorist organization after the Bali bombings, JI - like Al Qaeda - draws its financial and spiritual support from the extremist minority of the population. The embassy bombing has thrown the focus of both Indonesia's and Australia's upcoming elections squarely onto national security and the fight against terror. How the respective candidates handle these issues could well provide the key to their electoral chances. The embassy attack has been likened to the March 11 Madrid train bombing that many observers believe changed the course of the Spanish election campaign. The detonation of as many as ten bombs centered around the main Atocha railway station in Madrid – an operation carried out by extremists protesting Spain’s involvement in Iraq - killed over 200 people and injured thousands. With the attack occuring only three days before the Spanish election, the ruling conservative Popular Party (PP), led by pro-United States Prime Minister Jose Maria Aznar, attempted to divert attention away from their commitment to Iraq by blaming the attack on the Basque separatist group ETA, a claim later proven to be false. Spanish voters, angry at their government’s evident deception and apparently blatant attempt to make political capital out of the attacks, turned against the Popular Party and voted into office the Socialist Workers Party (PSOE). The Socialists, under Jose Luis Rodriguez, had until then been given little chance of winning. The Australian general election will take place on Oct. 9. In the initial days after the Jakarta embassy bombing, it was noticeable that both Prime Minister John Howard and opposition leader Mark Latham attempted to project a calm, statesman-like air creating a bipartisan sense of control. Latham, whose election tax package centerpiece was sidelined as a result of the attack, saw this and other aspects of his campaign strategy pushed to the background as he endeavored to be seen as supportive of the prime minister. Howard used the opportunity to calmly inform and reassure the Australian public and both he and Latham agreed to call a halt to campaign activities for two days following the news of the tragedy. However, the question of national security was prominent as the two resumed election campaign hostilities in the candidates’ televised debate, which aired on Nine Network on Sept. 12. Latham was critical of the government’s national security policies and linked the issue of the embassy assault with Australia’s involvement in Iraq. "We need to identify and eliminate these terrorists," Latham said, "we need to break up and destroy JI [Jemaah Islamiah] in particular and this has been the problem with the commitment in Iraq as so many experts have pointed out, it's made Australia a larger target, it's made us less safe in the war against terror." Concentrating on the cost of the decision to support the United States in Iraq Latham went on to say, “I've no doubt that if all of the time, the effort, the money, the resources that went into Iraq had been used to break up Al Qaeda, the world today would be a safer place. Australia would be safer and more secure." This statement followed months of denial by the Howard government that involvement in Iraq exposed Australia to greater risk of terrorist attack. Anderson, seeking to clarify his remarks, later claimed he had been misunderstood. However, despite pressure over the government’s Iraq policy, the emergency has thrown national security to the forefront of the election campaign, and Howard knows he is on familiar and comfortable territory. Polls have consistently shown that the Howard government is preferred by the voting public in the area of national security, and Howard has repeatedly made the valid point that certain fundamentalist and nationalistic Indonesian organizations – including JI - have long held Australia to blame for its role in the gaining of East Timorese independence in 2002. A video released by none other than Osama bin Laden warned Australia of dire consequences for its support of East Timor. Howard has also attempted to deflect criticism of the increased likelihood of Australia becoming a terrorist target due to its involvement in the Iraq war by highlighting the fact that the Bali bombings were carried out before the Iraq war. Indonesian president Megawati Sukarnoputri also faces an election, on Sept. 20. With polls currently showing Megawati trailing her former security minister Susilo Bambang Yudhoyono, this latest bombing on her watch will only serve to increase the public’s frustration with Megawati’s apparent inability to stop JI terror. Slow to react to the 2002 Bali bombings, Megawati immediately returned to the scene of the tragedy on Thursday from her visit to Brunei. Visiting the injured and condemning the carnage, Megawati struggled to regain lost electoral support. But with President Megawati’s half-hearted attempt to stamp out terrorism for fear of offending Muslim sentiments a cause for voter concern, an aide for Megawati has conceded that up to 5 percent of the vote may have been lost due to Thursday’s bombing. In a reflection of the Howard-Latham campaign hiatus, neither Megawati nor Yudhoyono have indulged in public criticism of one another over the issue. Susilo Bambang Yudhoyono, or SBY as he is popularly known, will benefit from the terrorist attack purely because of his perceived strength as an ex-military man and security minister. As leader of the fledgling Democrat party, the ex-four-star general is running on a platform of defeating terrorism, naming it as one of the country’s main threats. Thursday’s embassy assault will only add to his charge that President Megawati has not done enough to control the threat of JI and that Indonesia is in need of a change in government. As the most likely beneficiaries of the violence are likely to be the perceived stronger candidates on national security, it is difficult to understand what advantage the terrorists will have gained. Jemaah Islamiah – if they are in fact responsible for the atrocity – may well have provided conservative, pro-United States contenders Howard and SBY with a priceless opportunity to play to their political strengths. However, regardless of whoever gains office in Australia and Indonesia, the end result of the embassy bombing, aside from the tragic loss of life and suffering, will surely be a hardening of attitudes against terrorism in the region. Terrorism in South East Asia would appear to have gained little if any benefit from Thursday’s atrocity.